When we say “have a gold one,” we aren’t kidding. 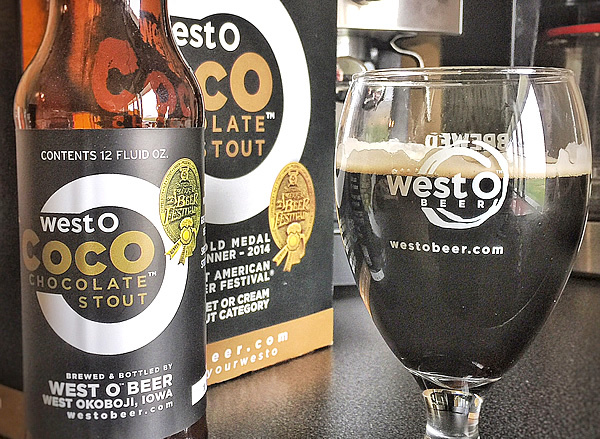 West O CocO Chocolate Stout™ is a double gold medal winner at the Great American Beer Fest®, Sweet or Cream Stout category, in 2014 and 2015. In March 2016, CocO won the first ever Des Moines Register March Madness Beer Bracket competition among 64 Iowa beers that are all available at the recently opened Iowa Taproom in Des Moines. If we were prone to hyperbole, we might say “voted the best beer in Iowa, by Iowans.” But, no… The real beneficiaries, we think, are Iowa craft beer lovers, who have a plethora of rock-solid beers to pick from. Sidebar: What’s the best temperature? CocO Stout, depending on which expert is talking, could be enjoyed anywhere from slightly chilled (a few minutes in a snow drift, about 45°) to cellar temperature (50°ish), to, well, room temperature. Really. Because warmer temps bring out the complex flavors and aromas of a nice strong beer. Likewise, you can pass on chilling that glass. Bonus points for your taste buds if you savor your CocO while it slowly warms in your glass. Lawnmower beer (and you know who we’re talking about) this is not. But bottom line: this is not about putting on hoity toity appearances. It’s about what tastes good, and you get to decide what’s best for you. Now, about those back-to-back gold medals. Brewer Karl Schmitz, who created the recipe for West O CocO, summed up the significance in 2014. “It’s a huge festival, and one of the biggest beer competitions in the United States. 268 medals were given out this year, out of 5507 entries.” In 2014, in the category of Sweet or Cream Stout alone, West O CocO bested 62 other entries from across the United States. In 2015, there were 75 entries from all over the U.S. It goes without saying that Iowa is a big winner here. In addition to West O Beer’s win, Exile Brewing (Des Moines) won with “Gigi”, a European-style dark Müncher Dunkel, and Lion Bridge (Cedar Rapids) won with “Disaster at Meux”, a brown porter. Founder Matt Matthiesen says “our goal has always been ‘Brew Better Beer’ and that implies that we are constantly raising the bar.” Rather than rest on our laurels, we have our work cut out for us. You’re going to hear us talk about “the Gold” from time to time, and now you know why. It’s a win (times 3) for us, but a win for you as well. Skål!